Open cellphone back cover, take out batteries and wipe clean the pasting position of signal sticker. Then slightly tear off signal booster from blister card and paste it well with the "" UP SIDE "" aligning with cellphone antenna. Network Type: GSM. 1 x GSM phone signal amplifier. Antenna: Built-in. 1 x Outdoor suction cup antenna. 1 x Indoor small omnidirectional antenna. Output Power: 27bBmW. 1 x English manual. Quantity: 1Piece. GSM/3G 900/2100MHz Repeater,GSM/PCS 900/1900MHz Repeater. CDMA/3G 800/2100MHz Repeater,CDMA/PCS 800/1900MHz Repeater. CDMA/DCS 800/1800MHz Repeater,CDMA/GSM 800/900MHz Repeater. DCS: UL: 1710-1785 MHz DL: 1805-1880MHz. Ganancia: 6dBi. 1x señal antena Booster. conector de 3,5 mm tipo: 2.5mm o. especificaciones: rango de frecuencia: 1880 - 1920 / 1990-2170mhz. impedancia de entrada: 50 Ohms. Indoor Dual Band Wall Panel Antenna for Cell Phone Signal Booster Repeater. Wireless Communications and data transmission repeater. You may also like. 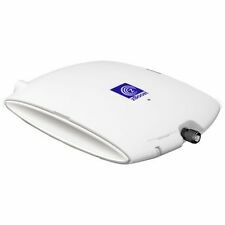 The Cell Phone Signal Booster supports GSM/dcs1800 ,it works with GSM/DCS 1800MHz 3G network,it supports any wireless operator in the frequency range of 1710 ~ 1785MHz and 1805 ~ 1885MHz. It could only strengthen cell phone signal, could not produce cell phone signal,if there is no cell phone signal at all in your area,there is no need to use it. Am 02.01.19 hat der Verkäufer die folgenden Angaben hinzugefügt United States. United Kingdom. We will reply you within 48 Hours. We are committed to resolve all issues in a friendly and satisfactory manner. The repeater device features easy installation & operation, build-in indoor antenna and no interference. The device featured by easy installation & operation and no interference. 1 x 3G/UMTS/WCDMA 2100Mhz cellphone repeater. Esta última investigación resultado celular Antena señal booster impedirá la mala señal cuando viajes, montañismo, tomando el ascensor. Volver las baterías y la cubierta, y luego encender. A continuación puede encontrar una traducción automática al español. Strength the signals of GSM and CDMA for every phone. 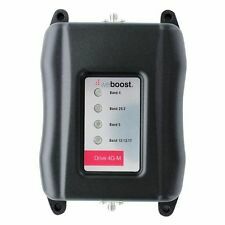 1 xGSM/CDMA/850-1900MHz 3G 4G Cellphone Signal Booster Amplifier Antenna Holder. 1 x 9dBi Gain Signal Booster Antenna. Attach a phone holder for better signal. 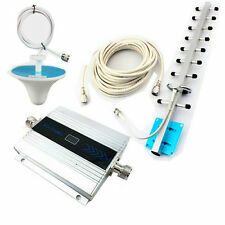 Select the appropriate location of outdoor antenna, outdoor antenna fixed on the wall or the bracket. Install a host device, fixed in the wall or the bracket. Outdoor antenna connected to a host of outdoor(BST) interface, tighten the joint. 1 x WCDMA 2100Mhz cellphone repeater. WCDMA booster works at full duplex. 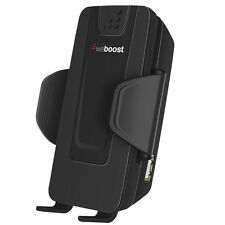 WCDMA booster are able to work within the different climate zones with high and low temperatures and humidity. The outside antenna sends the received signal through the coax cable to the installed gsm booster. 1x 850MHz Repeater. Signal using a small power cover-age within building will be more uniform, reduce the cost of inputs. One is the indoor antenna which communicates with your cell phone or laptop data card, and another one is the outdoor antenna which communicates with the cell tower. Equipaggiato con 10 metri 5dB Omi-direzionale l'antenna esterna, adatta alle aree in cui il segnale di rete mobile dell'operatore wireless e' buona.Equipaggiato con 3dB l'antenna interna, la copertura del segnale potrebbe arrivare fino al 150M2 senza ostacoli, e' la scelta migliore per la casa piccola.Non c'e' bisogno di usare gli accessori supplementari, Basta collegare e utilizzare.Alto guadagno, facile da installare e funzionare.Descrizione prodottoColore: OroGamma di frequenza: Uplink 1930 ~ 1990MHz Downlink 2110 ~ 2180MHzGuadagno dell'amplificatore (dB): Uplink Gp≥50 Downlink Gp≥55Antenna esterna Guadagno (dB): 5Antenna interna Guadagno (dB): 3Esportazione di alimentazione (Po): ≥10dBmOndulazione della banda passante: ≤3dBI/O Impedenza: 5050Ω/N. 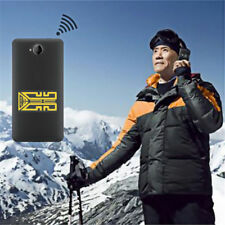 This latest research result cellphone antenna signal booster will prevent you from poor signal when travelling, mountaineering, taking the lift. Open cellphone back cover, take out batteries and wipe clean the pasting position of signal sticker. 1x signal booster antenna. Easy to install, enhance the digital/analogue signal and strength signal quality. Input Impedance:50 Ohms. Connector Type:2.5mm or 3.5mm. Frequency Range:1880-1920/1990-2170MHZ. Easy to install, enhance the digital/analogue signal and strength signal quality. Connector Type:3.5mm. Input Impedance:50 Ohms. (1 900MHz booster. the installed Repeater. 3) The Repeater accepts the low signal and improves it. 2) Connect outdoor antenna to BTS port in repeater machine through cable. need to add more indoor antennas and power divider / splitter. Gain (dB) : GSM Up link≥55; GSM Down link≥60. Pass band ripple GSM : 4dB. -Good isolation,and signal stability. Outdoor Antenna. Usage type : Sucker Antenna. -Protracting cellular battery life and reduce radiation of cellphones. This is only repeater,can not working without antennas and cable. 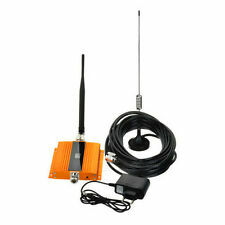 NEW TYPE mini LCD DISPLAY GSM900MHZ REPEATER,60DBi gain,CAN SUPPORT two indoor antennas ,cover up TO 200--300SQM. 1 x GSM 900 cellphone repeater. 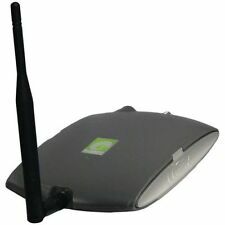 High Gain 4G LTE Antenna WiFi Signal Amplifier. - Frequency Range(MHz): 698-2700(MHz), get maximum wireless coverage and reliability for 4G LTE CPRS GSM 2.4G wireless signal. - No drivers: install the antenna do not need any other drivers, you could take this antenna for enhanced signal for outdoor activites. Connettore maschio SMA: l'antenna a lungo raggio per la ricezione di rete 4G è ideale per i tuoi punti di accesso. 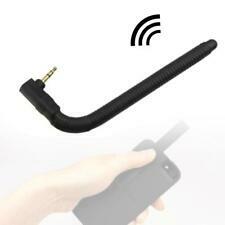 - Amplificatore di segnale WiFi per antenna esterna ad alto guadagno 4G LTE. - Gamma di frequenze (MHz): 700-2700 (MHz), ottengono la massima copertura wireless omnidirezionale e l'affidabilità per il segnale wireless 4G LTE CPRS GSM 2.4G. 2G, 3G, 4G and LTE Cellular Applications. LTE, CDMA, GSM, UMTS, AWS. 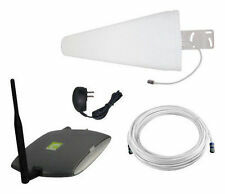 It can be used outdoors as a building antenna for direct access to cell tower signals for indoor amplifiers and boosters. It can also be used in warehouses or other indoor spaces to provide precise coverage to selected areas. Ganancia: 6dBi. 1x señal antena Booster. conector de 3,5 mm tipo: 2.5mm o. Esta garantía excluye cualquier daño causado por el usuario. especificaciones: rango de frecuencia: 1880 - 1920 / 1990-2170mhz. It is also a high-performance alternative to RG-8 and 9913. ThisWHITE high qualityUSA MADE AX400FRW™low loss 400 series coaxial jumper cable is25 feet long with a 50 OhmN Male Connector on one end and anN Female Connector on the other end.